Handler cues the dog to back away at least 2 ft. (0.6 m). Back-up target is optional. Purpose: Backing up prevents anticipation and creeping forward. Exercise set-up: Back up: Handler stands facing the dog and cues the dog to back up. A continuous cue is acceptable. A back-up target is optional. Handler may not move his/her feet. The exercise begins when the handler gives the back-up cue and ends when the dog has backed up continuously for 2 ft. (0.6 m). Non-qualifiers: Handler moves toward the dog when cueing the back-up behavior. Handler is unable to get the dog to move backwards. Dog moves forward toward handler before backing up the required distance. Dog sits or lies down anywhere within the required 2 ft. (0.6 m) distance. Dog deviates by more than 45 degrees when backing up. Video does not permit the exercise to be adequately judged. 1. Do not walk towards your dog during the back up! 2. 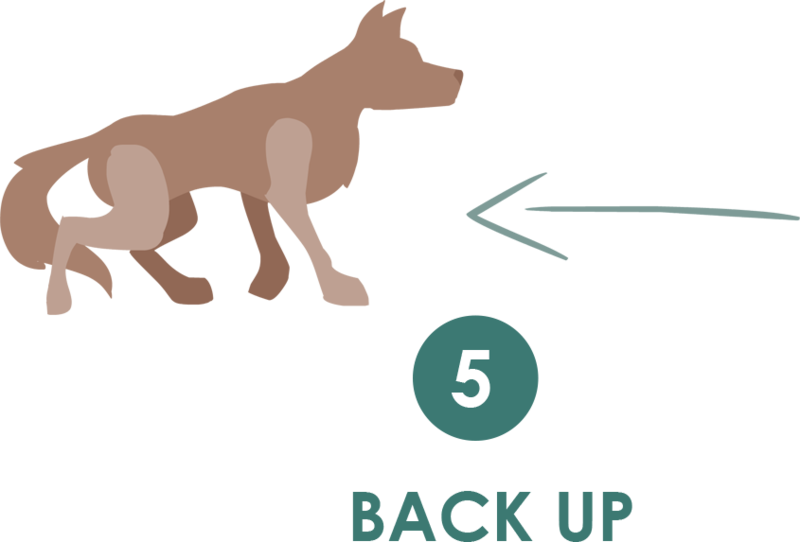 While a continuous back-up cue is fine, the dog must not stop and start — the dog must back up the entire time, at any speed (or combination of speeds).